Top row: Joe Isom, Chris Rayis and Brian Katona. 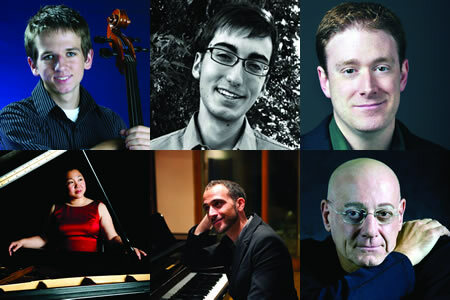 Bottom row: Young Park, Tomer Adaddi and Michael Pedicin. I joined Local 802 after hearing great things about the union from other musicians. I was also intrigued by the benefits and services that come with being a member. I’m always trying to make my presence known in the New York area, and hope to establish more connections that are beneficial in giving me opportunities to gig in the city. One of my recent gigs was playing in a Harlem Sounds Project at the Church of the Intercession. It was a great opportunity to play interesting music with new people. My principal instrument is cello. I joined Local 802 within a few weeks of moving to New York City. By joining, I hope to take a step toward becoming part of the community of theatre musicians. I seek to learn from the great composers, conductors, and pianists who maintain a level of excellence unrivaled in any other part of the country. Recently, I had the honor of playing rehearsals for “Far From Heaven” at Playwrights Horizons, under the steady guidance of Larry Yurman and Andrew Resnick. I got that gig after an extraordinary chain of events that began with my being seated at a table with Scott Frankel and Michael Greif when I attended Adam Guettel’s recent concert series at 54 Below. I joined Local 802 after I became a member of the BMI Musical Theatre Workshop last year. That helped push me into various other musical theatre work in the city. I am a conductor, pianist and composer, and my ultimate musical goal in NYC is to have a show of mine on Broadway. Recently, I was working on the new musical “Empress” with librettist and lyricist Barry Harman (“Romance, Romance”). I joined Local 802 — after hearing great things about the union — in order to be a part of a bigger and more active music community. Also, my piano trio (The Trio Venia) wanted to have more opportunities to perform in NYC. One of my musical goals is to perform at places where music doesn’t currently exist (i.e., retirement homes, hospitals, nursing homes) and collaborate with other instrumentalists. I have been visiting and volunteering at James Lenox House – a retirement home on the Upper East Side — every month since 2007. I give an hour-long concert under the title “Young Park & Friends.” I also recently performed an outreach concert with my piano trio at a nursing home in Flushing. My principal instrument is piano. I joined Local 802 after working on Jackie Evancho’s recent album. My musical goal in NYC is to establish myself as a songwriter, producer and performer as well as a composer of orchestral music and film scores. I would love to work with great vocalists and also to music direct at the highest level possible. One of my recent gigs was working on a Michael Buble project, and I got it through my previous work with L.A.-based producers. Also, my piano concerto was recently debuted with different orchestras around the world, following its debut in NYC. My principal instrument is piano. I rejoined Local 802 after finally moving back to New York and because Local 802 is the best AFM local on the planet. I have always been a union member: I joined AFM Local 77 (Philadelphia) as a teenager, and I always contribute to the AFM pension plan as a leader/contractor. I hope to be able to help my fellow jazz musicians with our cause of fair play and justice through the union’s Justice for Jazz Artists campaign. My goal here is to do more playing and to spend more time with the amazing jazz musicians that help make NYC the great city that it is. One of my recent notable gigs was performing at the Dave Brubeck celebration and tribute, which took place at the Cathedral of St. John the Divine. (I am a Brubeck alumnus, having played with his quartet in the 1980s.) My principal instrument is the tenor saxophone, and I am recording my eleventh CD as a leader in May.